This prestigious room is dedicated to the Japanese Emperor Akihito that sojourned in Villa Cora in 1982. The suite is located on the "Nobel Floor" and occupies the whole facade of the villa with a view of the city and of the internal garden. The room also has a small balcony. inlaid wooden floor rests a majestic red velvet four-poster bed. The room also has a living room area with antique furniture. 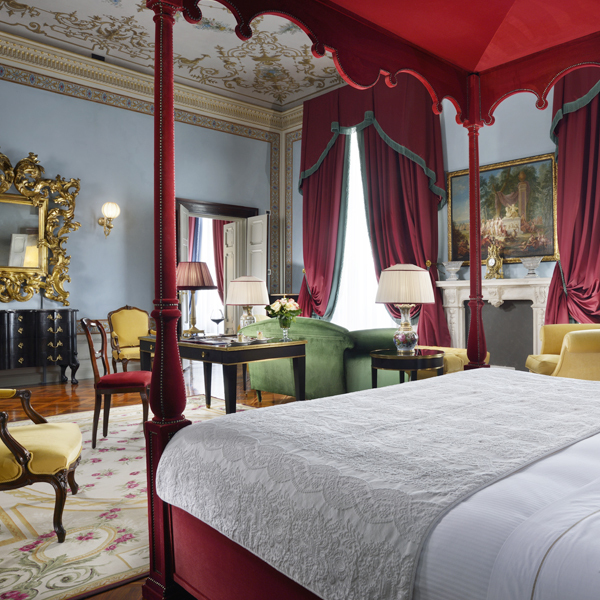 The Imperial Suite also has a second room that is frescoed as well, and has brilliant blue four-poster bed. Both rooms have elegant bathrooms made with Carrara marble and furnished with exclusive beauty products.